PC games ported to Mac soon won’t look or perform much worse than they do on their native platform, thanks to external graphics card (eGPU) support from the famed producer of PC game ports on Mac, Feral Interactive. Feral announced during E3 2018 that, starting with the 2015 Rise of the Tomb Raider game, the studio’s ports will support eGPUs on macOS. 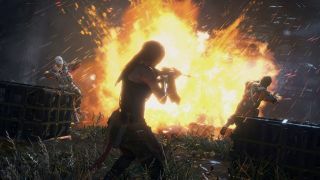 “We’re happy to confirm that eGPUs are now officially supported in ‘Rise of the Tomb Raider: 20 Year Celebration,’ Lara Croft’s epic Siberian expedition,” Feral stated in a blog post. Specifically, this means any iMac since 2017 or MacBook Pro since 2016 (and the iMac Pro) can play Rise of the Tomb Raider, with an eGPU powering the graphics through their included Thunderbolt 3 ports. This blows the gate wide open for future PC games ported to Mac to support graphics more powerful than Apple will likely ever include in its computers, closing the gap between gaming performance on PC and Mac. The only hurdle left then is the processor, which we don’t see improving to meet PC standards any time soon.